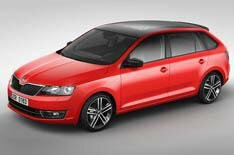 2013 Skoda Rapid Spaceback revealed | What Car? This is the Skoda Rapid Spaceback, a shortened version of the Rapid hatchback that's designed to give the model a sportier look that's more appealing to younger buyers. The car has similar proportions to the Audi A3 Sportback and should offer similar levels of interior practicality. It is 180mm shorter than the hatchback, so boot capacity is cut by 135 litres compared with its sibling the new car has 415 litres with the seats in place and 1380 litres with them folded down. The rear access and legroom in the Rapid hatchback is excellent, and because the Spaceback keeps the same amount of space between the wheels, it should retain that impressive practicality. The boot will also have a dual-level adjustable floor to boost flexibility. The Spaceback will have interior trim upgrades over the hatchback, and will offer buyers options to customise the exterior of the car. A panoramic glass roof will be available, as well as a 'prolong' rear window. This carries the glass further down the rear tailgate and, combined with a black spoiler, gives the impression of tinted glass that runs the full length of the car. Engine options include four petrols and two diesels carried over from the hatchback. The petrol units will range from the 74bhp 1.2-litre to a 120bhp 1.4. The diesel options include a new 88bhp 1.6-litre engine with average economy of 74.3mpg and CO2 emissions of 99g/km. The car will be revealed at the Frankfurt motor show in September. Prices haven't been announced, but the car will go on sale in the UK by the end of the year.